On Friday, April 12, Winning Approaches for Talented Transfers in STEM (WATTS) Scholarship recipients and additional science majors participated in a Career Development Employer Tour coordinated by the Career Planning & Development Center and Biological Sciences. Accompanied by Biological Sciences faculty members Stephanie Schroeder, Ryan Groeneman, and Mary Preuss in Webster's College of Arts & Sciences; John Holste, assistant director, Career Development and Trezette Dixon, assistant director, Employer Relations, both in Webster's Career Planning & Development Center, students visited BioSTL and MilliporeSigma. Scientist from several organizations in BioSTL shared their insight on careers in science and the thriving science start-up community in St. Louis. Madeline Lackey, Webster Alum and Concierge/Reception Specialist, provided information on the newly opened St. Louis Cortex Innovation Community (CIC). Organizations included Genoscopy, BioGenerator, VaxNewMo and WUGEN. 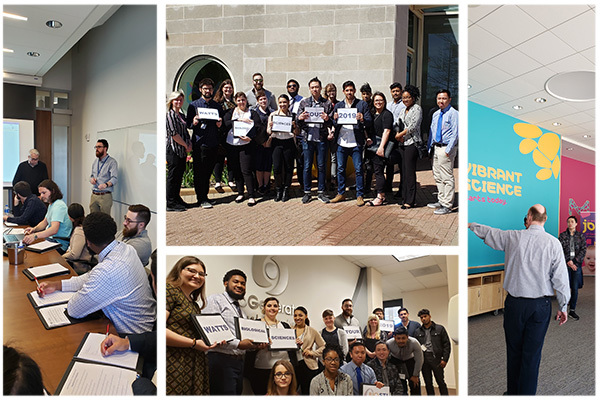 At MilliporeSigma, students received an in-depth look into the many divisions and innovative accomplishments since the merger of Sigma Aldrich and a tour of the St. Louis headquarters including labs and creative workspace. Students also got a chance to talk to Irfan Hodzic, Webster Alum and Associate Scientist Process Solutions|Upstream R&D at MilliporeSigma, who shared his transition from student to scientist and advice on participating in internships prior to graduation. This event, co-hosted by the Career Planning & Development Center and the Department of Biological Sciences in the College of Arts & Sciences, is an example of a meaningful, cross-campus collaboration that promotes student learning and success. The WATTS scholarship program for transfer students in biology and chemistry is funded by the National Science Foundation S-STEM grant program.